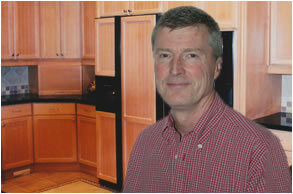 My interest in the residential kitchen business began some 40 years ago when I worked in the cabinet division of my father’s manufacturing business in Brantford, Ontario. While there I learned that quality of product and service must be uncompromising. In later years, I gained additional training in the building trades section of residential construction. That experience came when I worked at Johnson’s Home Centre, Blue Mountain Flooring and Kitchens, and Haven’s Home Building Centre over a period of some 25 years. The culmination of this background helped my decision to form Town and Country Kitchens Ltd. Its purpose is to provide a design and installation service dedicated to the new premium home market. My belief is that there is a genuine need for a competent source for ideas and knowledge covering the latest innovation in new products and materials. Town and Country Kitchens Ltd. provides individual custom design, exceptionally fine quality custom cabinetry and outstanding craftsmanship in installations. A word about my main cabinet supplier with whom I have done business for more than 10 years: they are Elmwood Kitchens of St. Catharines, Ontario, a top of the line custom quality manufacturer who has been in business for over 34 years. Their reputation for quality products, outstanding design, use of a variety of species and fine furniture finishing, make them my supplier of choice. They also have an enviable record for “on time” delivery. I am proud to have been appointed as their exclusive dealer for our area of Georgian Bay. My kitchen and bath design experience, coupled with my reputation for personal involvement in all my projects has given me strong support from the area’s top housing contractors. That and my list of satisfied customers over the years gives me confidence in the success of Town and Country Kitchens Ltd.